The Way to Happiness is comprised of twenty-one precepts, each one predicated on the fact that one’s survival depends on the survival of others and that without the survival of others, no joy and no happiness are attainable. Read it for yourself and give copies to those whose happiness you care about. 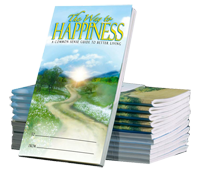 Pocket-size booklets come in bundles of 12 so you can share them with friends, family and associates. Available in 97 languages.